Item Number: 810-S4031 18383 Actual Weight: 0.2 lb. 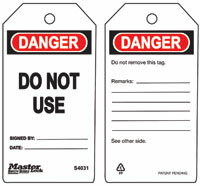 Make safety messages stand out while maintaining OSHA compliant signage and procedures throughout your facility. 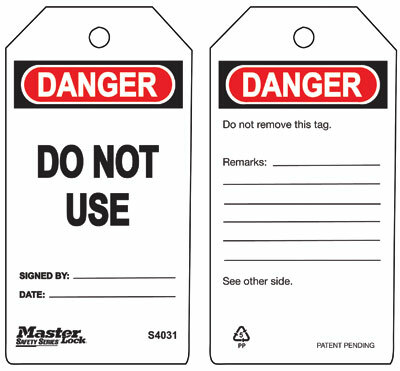 Durable, long-lasting tags are made from industrial grade polypropylene, allowing them to stand up to humidity, UV radiation, harsh chemicals, high and low temperatures, and more! Tag edges will not peel or curl so your safety message stays intact. Write with permanent marker and reuse to modify the message as often as needed. To reuse, clean off with isopropyl alcohol.